The garden is buzzing. My fears for the bee population and consequences for our fruit and vegetable harvest seem unfounded. After the late spring we've had some warm, even hot, days followed by rain with the result that everything is over-producing to catch up. The garden looks like a jungle. Loads of foliage, flowers - and weeds! Of necessity and by choice our garden is pretty wild, albeit based on a great design by the previous owners. We have a lot of comfrey which grows like crazy and the bees love. I let some grow at the edges of the vegetable beds to attract the bees who hopefully will move on to the beans and raspberries. 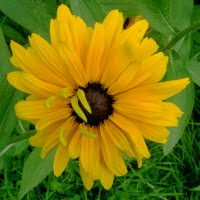 I'm not really fussed what insects do the pollination. Two years ago we had a wasps nest in the ground behind the greenhous and they did a sterling job with the raspberries and currants. 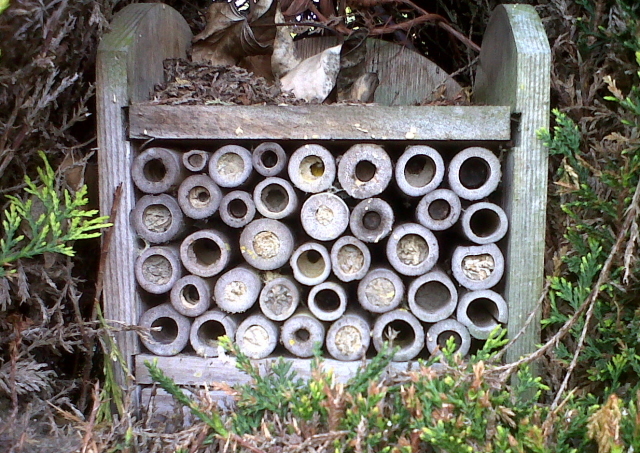 We were given an insect house which is basically a bunch of hollow bamboo canes in a wooden box and we placed it in a conifer hedge facing south east. We've noticed some activity in previous years with the ends of the bamboo filled with wax, but this year it's home to small bees. Fascinating to watch them come and go, laying down wax and sealing the tubes. Bee house - bees were shy when I took this photo but are busy and buzzing this morning. I don't know where the nearest conventional bee hives are. We certainly rely on a variety of types of bees as well as other insects for pollination and I guess I don't mind who gets the job done. Eating our first potatoes of 2013 tonight with some chicken breasts baked with garlic and ginger. Actually they are the saved 2012 Santes we planted in October in big tubs in the greenhouse so perhaps don't count as 2013 crop. 4 lbs from 4 seed potatoes doesn't sound a lot - but a couple of meals-worth of lovely, clean, worm-free spuds is great when this year's harvest will be another 4 weeks at least. 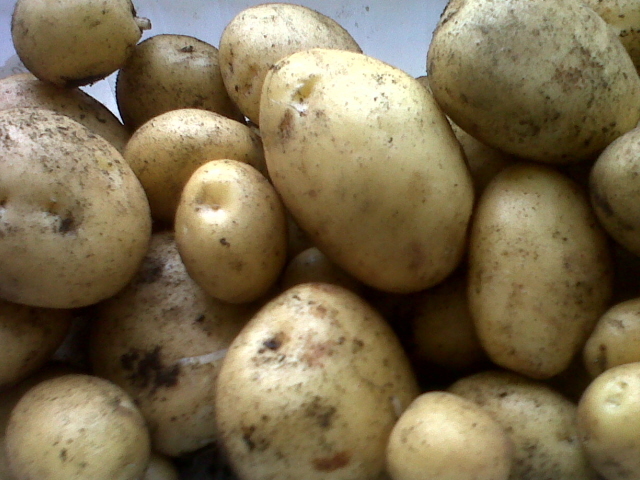 Home grown spuds taste so much better than shop-bought. The last few weeks the weather has been mixed - a few glorious days and then torrential downpours. Result - loads of weeding to be done. 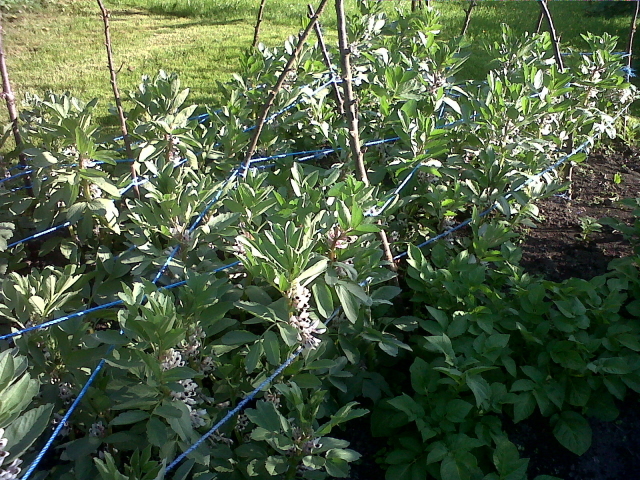 The wind and rain started to take its toll on the broad beans which are now looking pretty good. So I went out with stakes (from last year's fruit and walnut tree pruning) and 50 metres of rope. 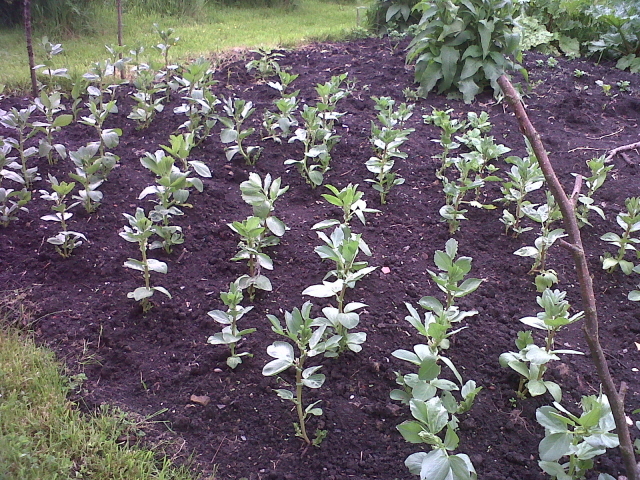 I have two banks of beans arranged 3 rows of 10 each (total 60 plants). I place stakes at each corner of each bank and two along each side then wrap the rope, about 18 inches off the ground all the way around the outside then criss-cross diagonals using the stakes along the sides. This gives them support without having to stake each bean plant individually. The bees were really busy in the bean flowers but didn't bother me. 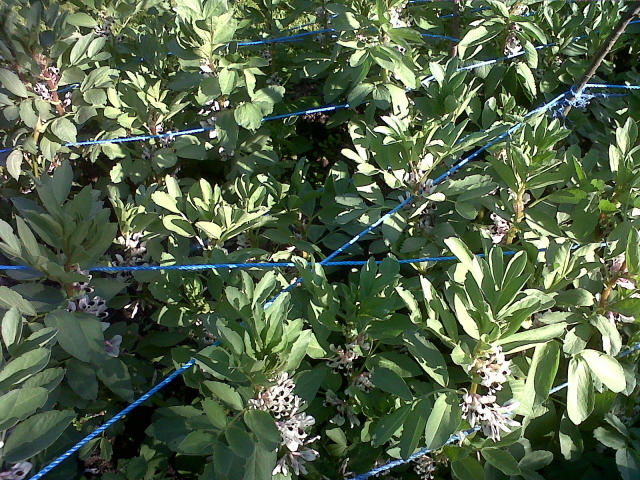 Criss-cross diagonal ropes keep the beans from being blown or flopping over. I use sticks from pruning trees - so they're not very straight! 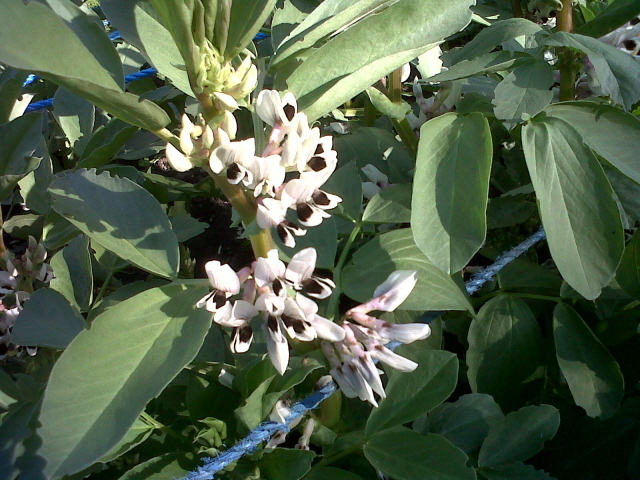 Beans as they were at the end of May.